It took me months of spare time knitting and some rows grew in my holidays in Rugia this July. I used my 2,5mm bamboo dpns, which I got as a present from my Wollfee - Pal. I managed to damage one of the needles and then to repair it somehow - it is now shorter and I changed the dpns for the heels and used aluminium ones but I really quite like the bamboo ones. More than I had expected. It´s not so obvious on the photos but each row of the socks has another colour and not only did colours repeat but some very different colours like grey, greyblue, darkblue, pink, dark brown and else appeared. Even though the legs are slightly too short for my taste, I love my socks and wear them from time to time. 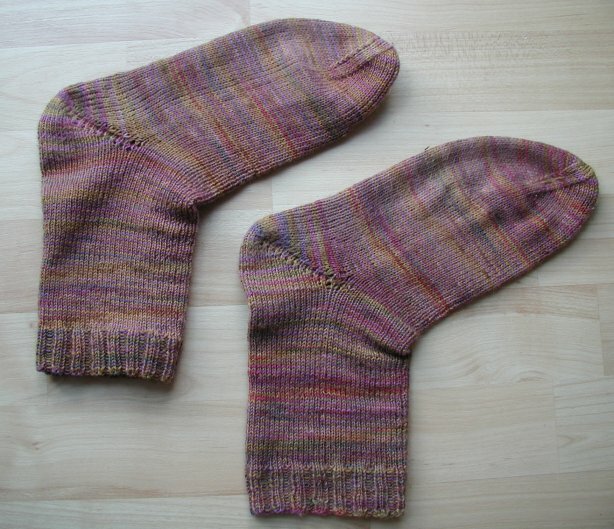 The next pair of sock yarn socks is for Ron. I started some cabled with thicker wool for me and somehow try to follow the tricky aran pattern. Well, now it´s my turn to tag people, who haven´t been tagged yet and therefore I tag the following persons: Anja, Yaga, Theresia, Tina, Aileen, Isobel and Sara . Much pleasure, girls! And then there was some crafting work yesterday, I was very hard-working. The first thing was that I bought some coloured cardboard sheets some months ago in Strausberg, where I worked. The size is DIN A2 and the width is 52 cm. I didn´t use it for a long time. I saw the maze books on Theresias page and watched the instructions on craftsweekly. I decided to give it a go and made one for Tina, which is made of purple cardboard, corrugated cardboard, a red ribbon and a paper with purple dots on it which I got from Anja. Last weekend my parents visited us and stayed in our house for a night and since I didn´t had the courage to cut my 52,0cm × 70,7cm cardboard on the desks or the kitchen floor (which is covered with flagstones) my daddy had to do it for me. We used a folded wallpapering table covered with old newspapers and due to a lack of a big enough ruler my dad used a tool that is supposed to hold it over the end of a fresh wallpapered wall and cut the wallpaper below in a perfect line. Afterwards I had to fold the cut cardboards (which were then 52cm x 52cm or 50cm x 50cm) cut some of the folds and the pages of the books were ready. Sunday noon I drove my parents home (about 1 hour drive and I did it all without a mistake *proud*) and after a short lunch my daddy used a very good and expensive passepartout cardboard to cut several pieces (4 pieces for one book) with his huge graphics designer equippment papercut gadget, which was extremely fast and accurate matter. Back home I took two identical cardboard pieces at a time and glued them together to make the cover or back cover of the books. After finishing and some time for letting the glue dry, I glued some of Anjas papers from her first "I want to make you curious about scrapbooking" parcel on the front of the covers, always following the instructions from the video tutorial. I then added the ribbon(s) but used instant adhersive instead of paste and except for the green ribbon which is from Anja of course, I had already bought all other ribbons myself. For the checked cover I used my leather pricker to make holes and then put those rectangular copper brads from making memories through them at the places where the ribbons were to fix the ribbons additionaly. 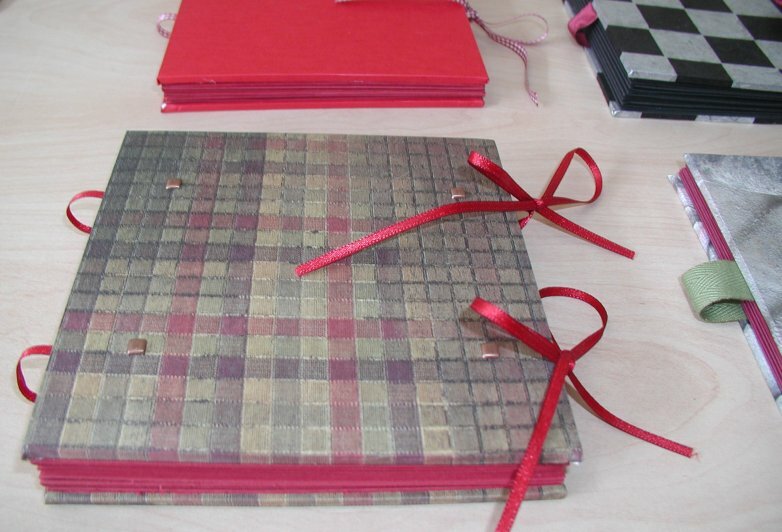 I then glued the "pages" with a crafters paste I bought from netto and used my selfbought bone folder to make it neat. 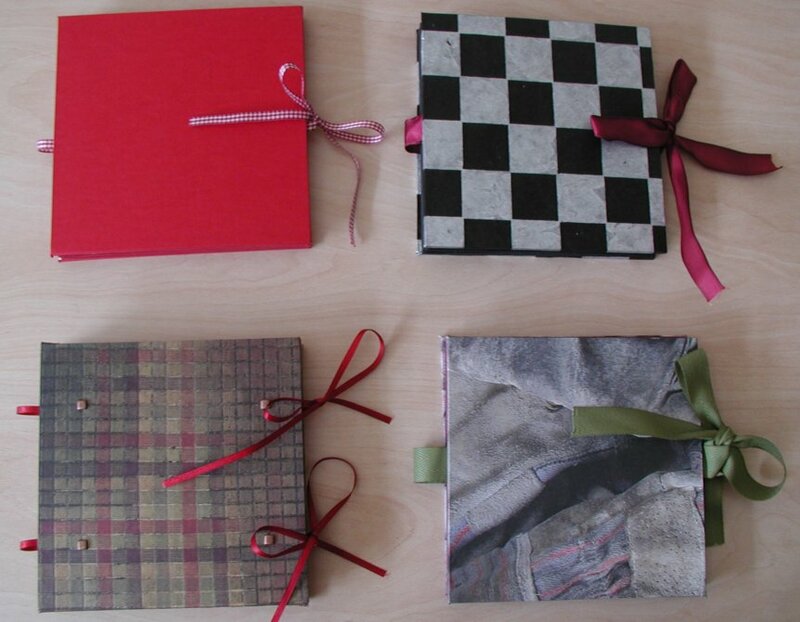 And like this I finished 4 wonderfull small books which have the sizes 13cm x 13cm, 12,8cm x 12,8cm and two of the 12,5cm x 12,5cm. Let´s see if I will keep them for myself or give some away or both. 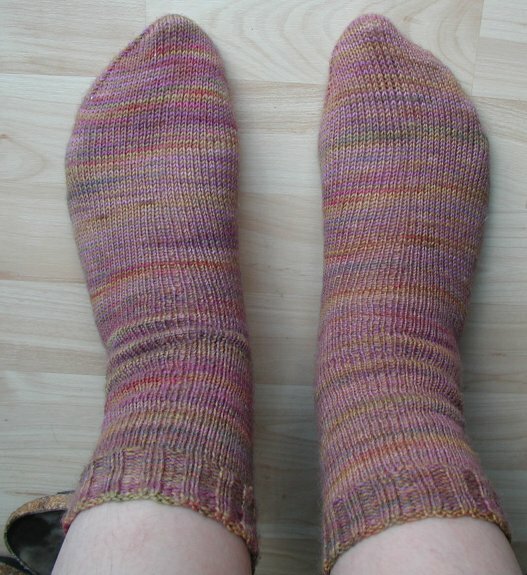 ^_^ Well and there are some news about my second sock. I have finished the rim, the leg, the heel and 49 of 69 rounds of the foot. Only 20 rounds left until I can finally start the toes. Can´t wait to do that, have been slowly enough and have soooooooooo much on the needles. This night I got a cute Hallmark eCard from Jenn to let me know that she will be my Secret Pal hostess and that she is going to inform the participants of her list about their matches. I am sooo anxious to know who it will be for me. I am going to keep you updated! After a round of being ready to get in as an angel, I am again part of Secret Pal. It´s been a year since I first joined and in the meantime I have participated in a lot of Swaps and got some good and bad experiences with those. I am really looking forward to the new round and hoping to have a better Secret Pal experience this time. I have contributed some buttons and of course hope to win a prize in the button contest. Dear pal and dear hostess, I have posted my Secret Pal questionaire online, you can get there by clicking the link below the Secret Pal 11 image in the right navigation bar quite at the bottom. Same goes for the wishlist, refered to in the questionaire. I gave it a makeover. Of course you can mail me with any questions you might have anytime.